To bring a sense of unity to an otherwise hodgepodge-collection of herbs, I edged each bed with Gomphrena ‘Gnome Purple,’ pictured above. 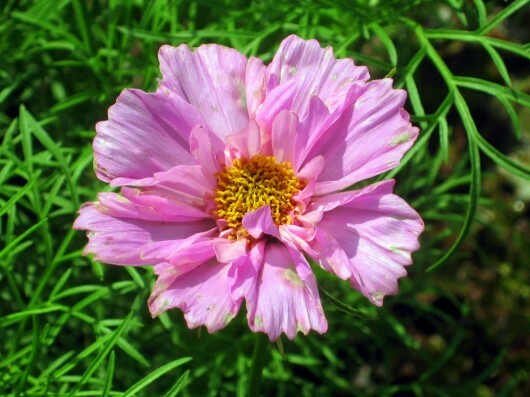 Further harmony is provided by the tall, lacy-leaved Cosmos ‘Double Pink Bon-Bon’ (above), placed in the center of each bed. Here are the contents of the raised beds (pictured above, in clockwise movement): #1 Bok Choy, a stir-fry indispensable; Lemon Verbena, a must for white wine; and Lovage, a celery-flavored perennial. #2 Flat-leaf parsley for flavor and garnish; lavender ‘Munstead’ for icing cupcakes; common sage, which I fry as an appetizer, and cilantro for salsa verde. #3 Green leaf lettuce, purple sage for who-knows-what; French tarragon for sauteed mushrooms and herbal mayonnaise; pelargonium ‘True Rose’ for vodka drinks, and rosemary for shirred eggs. #4 Red oak-leaf lettuce; oregano and thyme for pizza and pasta sauces; winter savory for winter stews. Because this garden is located in the “L” formed by two wings of my house, fencing was needed on just two sides. Climbing the fence are morning glories on the west, and cucumbers on the north. Interspersed beneath these are purple and green basil, and white, evening-scented nicotiana. Seating, to me an absolute necessity in any garden, is here provided by a rocking bench, two Adironack-style chairs, and a table that seats four. All these are placed at the south end of the garden. There the hot afternoon sun is tempered by a wing of the house. 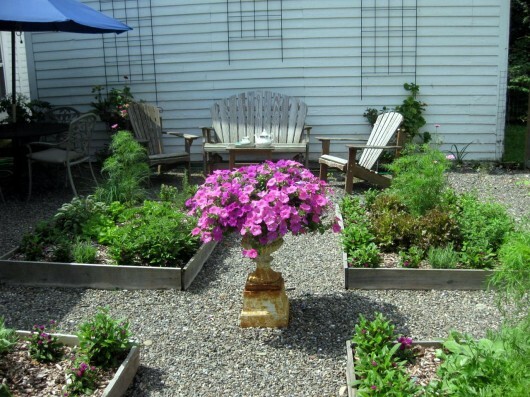 Colorful sights, pleasing scents and comfortable seating — these are the things which make this herb garden a relaxing retreat. Why not plan a similar venture for your own enjoyment? 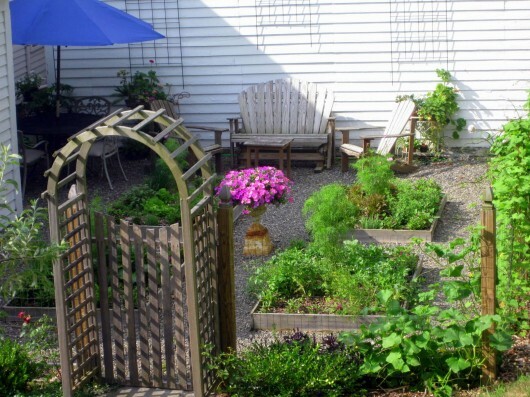 If you use, as I did, inexpensive pressure treated lumber for the fence posts, wire mesh for fencing, pea-gravel for paving, and simple pine for framing the raised beds, you will find this satisfying, easy-to-maintain garden can be achieved for about $150. Really. Katreader — well, if one of those herbs is mint, you really have to keep it in a pot! Kevin, two questions: how tall is your fence, and where did you get the finials? Eric – the wire-mesh fence is 4-feet tall. Finials were purchased from a local lumber yard. They were $4 each, and came equipped with a screw in the bottom. This made them very easy to install. Kevin, I feel proud to live in the same town as such a talented person. You do make me feel inadequate in comparison though but still I am thrilled with what I learn from you and what my eyes are treated to day after day. You have made a huge and positive impression on me. May the force be with you! You rock! Brigid – you are too kind! Erin – freshly-snipped herbs on a thin-crust pizza: heaven! Kevin, another lovely garden! So glad you like “Gomp” too! Adele – yes, the dwarf Gomphrena is marvelous for edging. It stays around 6-inches tall and about as wide. Your herb garden looks lovely. Next year I would definitely like to get some Bok Choy in my garden! This year seems to be extremely early in my garden. I am ready to plant more broccolis and have been for a couple of weeks but have held off because of the heat and lack of rain. The same with the beets. My red bliss potatoes are ready to harvest. The top growth has totally died down. That is quite early isn’t it? Also my garlic is ready to harvest as their top growth has also died back. I did dig 2 yesterday to use in a pasta dish. One was quite small the other was medium. Hopefully I have some large ones! My Morning Glories are not blooming yet. I am thinking that perhaps the soil in the veggie garden is too rich but I have morning glories planted in 7 other places and none of those are blooming either. They are all growing so I expect that I will get flowers eventually and I really did plant them for late color because everything seems to be blooming so early this year. My legs are totally work out from doing rain dances and yet we have had no real rain! My poor gardens are suffering, not to mention the potted plants. I am hopeful that tomorrow will actually bring some real rain but I have hoped that many times in the last few weeks! Randy – I've learned to be patient with morning glories. Their big budding time here is August, and then they bloom and bloom until frost. Ahhhhhhh, I feel so inadequate next to you with your immense talents for gardening and cooking. You rock. I have been following your blog for about two months. Amazing how you keep the discussion going every week. Excellent effort! Your wood in the raised bed is cedar? How long does it last before replacement? I am using 2 by Douglas fir and hope to get 10 years, it’s less than half the cost of 1″ cedar. Hi Wolfgang – Douglas fir is rot-resistant; you made a good choice for your raised bed. The four raised beds in my Herb Garden were made from (cheap) 1-inch thick pine. 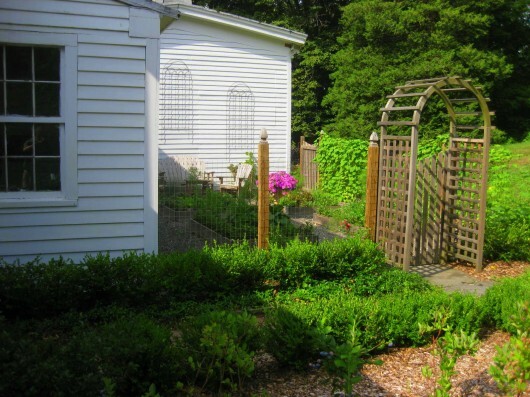 The raised beds in my Kitchen Garden were made from 2-inch thick, rough-hewn hemlock. 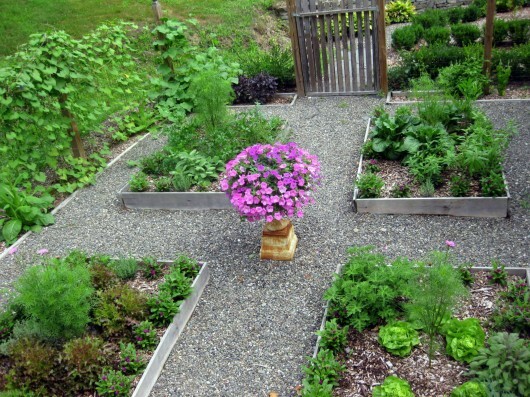 You can read more about these beds, and their durability, in my article Creating a Raised Bed Garden. 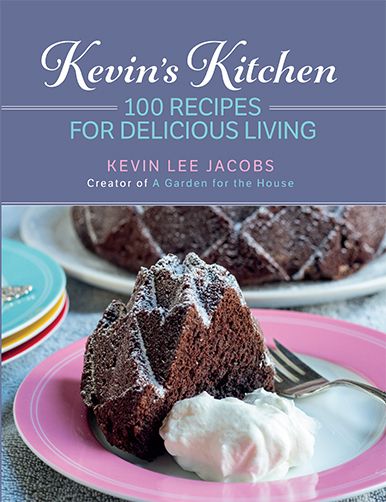 Kevin, What type of soil do you use for your herb garden? Being a raised bed, I assume you used some kind of bagged soil? What kind do herbs like best? Dear Kevin, I hope Lily was great protection from the Vicious squirrels! 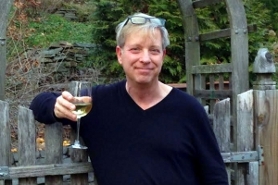 I cannot tell you how much I love reading your posts – you are an amazing and fabulous gardener, cook and host. I should add designer and decorator. I very much appreciate your experience and website. Thanks so much! Dear Kevin, here is an idea to keep your pine boards in the raised beds protected from excess moisture. My pine boards rotted after 2-3 seasons. In the new boards, I stapled some plastic, covering the top, and going down the inside, where the good soil will be, and curving into the dirt area. Thanks for the wonderful treat you serve up weekly! I enjoy it like I used to enjoy the Sunday paper with all the good sections and the magazines and the funnies. You are such a gift to all of us readers! Bless you! 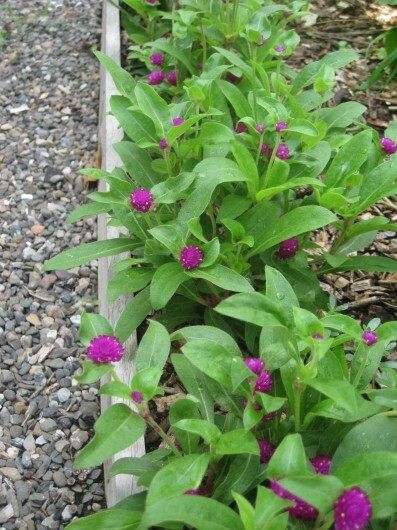 Enjoyed my visit to your herb garden and love the idea of edging with gomphrena. Nice touch. There is also horticultural vinegar which is supposed to be stronger – I have some but have not yet tried to kill the weeds in my gravel driveway. The vinegar comes in a huge jug – maybe a gallon size. It sure has to be better than RoundUp which I am told I should not even have in my garden shed. Bad for me and bad for Nature!